The third installment of our cheesecake trio has arrived, and it's quite possibly the best one yet! What makes this Easy No Bake Cheesecake so amazing is the simple chocolate ganache we've created to top it with! If you prefer to watch over read then check out the video of me making the recipes below! I break it down for you, one by one. After creating our first two cheesecake recipes which have crusts we knew a third was in order. Why? Well, sometimes a crust just isn't necessary, and Matthew wanted to use his favorite food for the topping - Unsweetened Bakers Chocolate! He wasn't exactly sure how to make which is where my expertise came in handy. 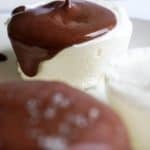 Melt the chocolate, add some heavy whipping cream, a splash of water and you have a decadent, creamy chocolate ganache. This recipe is even easier than the others. Since there is no crust that needs to be made and frozen prior to filling the molds with cheesecake, this version can also be eaten sooner! All you have to do is make the filling, let it set (if you want) and top it with heavenly ganache. I know which one i'm making next time around! The best part about no bake recipes is the no bake aspect. Doesn't everyone want to do the least amount of work for the most about of deliciousness?! Yes, the answer is yes! If this is the first cheesecake recipe of ours you're checking out you need to head over to the other two and see which one you prefer. If you love cashews the Cashew Cheesecake is the one for you, but if you're a coco lover you need to try the Low Carb Chocolate Cheesecake! Either way, this Easy No Bake Cheesecake will surely answer all your sweet cravings. Recipe can be quickly added to MyFitnessPal - Search "KetoConnect - Easy No Bake Cheesecake"
Using a hand mixer cream together cream cheese, sour cream, heavy whipping cream and erythritol. Dollop filling into cupcake molds/tin and place in the fridge for 2-3 hours or freezer for 1-2 hours. Melt bakers chocolate in microwave. Add heavy whipping cream and combine well. Add splash of water and mix until you get a thick liquid consistency. Pour over top frozen cheesecakes and enjoy!